A programme of improvement works is set to start at Mossley West train station this month. Detailing the improvements scheme, a Translink spokesperson said: “We will be carrying out improvements to Mossley West station and Park and Ride area. “The work, which will include resurfacing the Park and Ride area, the platforms and the ramps, will start in mid-April and last approximately six weeks. 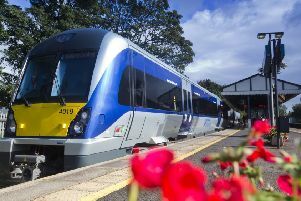 Welcoming the initiative, UKIP candidate in Three Mile Water DEA, Raymond Stewart said: “I have lobbied Translink persistently over the past two years on this and on an extension to the carpark. “This will commence within days and I wholeheartedly welcome such. The station has suffered neglect since being opened in the year 2000 and of course usage has far exceeded all expectations.